The beginnings of cannibalism is shrouded in the mists of time and more than likely we will never find out it's origins nor understand why some species, including humans, eat their own kind. Many anthropologists speculate that cannibalism began in the very earliest beginnings of known human history, probably even before any records of human history were ever made, and grew with man's unending need to appease whatever gods were worshipped, to survive famine and stave off starvation, or any of a number of other theories that have been presented by various and sundry scientists. Archaeological evidence seems to show that cannibalism has been practiced at least as far back as the Neolithic Period and Bronze Age in the areas that eventually became known as Europe and North and South America. In a book called Once Were Cannibals, the author Tim White stated that there was evidence found in Croatia that seemed to show that the indigenous Neanderthal tribes of the age practiced cannibalism. Many bones of Neanderthals discovered during an archaeological excavation apparently showed some evidence that this particular tribe of Neanderthals ate the brains of others of their kind. In Cannibalism and Archeology, the author gives some of the criteria archaeologists use to identify evidence of cannibalism from human remains found. These "earmarks" include skulls showing hammering to expose the brain, severe facial mutilation, burnt or boiled bones, dismemberment, cut marks, bone breakage made by hammer stones, etc. Even though not all of the criteria was met when studying the bones archaeologists discovered in Croatia, main of the most crucial "earmarks" pointing to the practice of cannibalism were present, including crushed skulls and bones, fire damage showing evidence that these bodies had been roasted over a fire and skulls hammered open in order to remove the brain. With the incredible wealth of archaeological and anthropological evidence that has been discovered in the countries of Africa, Australia, North and South America, the Middle East, and other parts of the world, all the evidence suggests the common frequency of cannibalistic practices is not nearly as uncommon as many people would think. The ideas and reasons behind the rather common practice of cannibalism varies from culture to culture, as well as being purely depended upon the type of situations that lead people to resort to cannibalism. This being said, there appears to be several types of cannibalism that are more prevalent in particular areas of the world and types that are dependent on certain situations. In many parts of the world, anthropologists have discovered that many cannibalistic tribes have usually incorporated many different forms of cannibalism into their way of life. 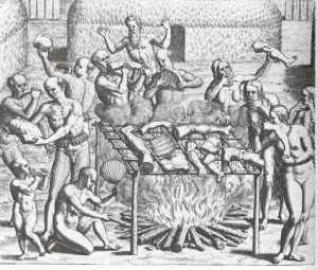 It is not at all uncommon for one particular culture or tribe to practice a mixture of ritualistic, endocannibalism and exocannibalism, as well as resorting to cannibalism for survival and what is known as epicurean/nutritional cannibalism, which is basically the consumption of human flesh purely for the taste or nutritional value. As one can see, the practice of cannibalism has been around since probably Mankind appeared on this blue ball we call Earth, but the reasons and why-fors behind it are still a mystery. A great many psychologists, psychiatrists, and other scientists have long sought for answers, and will continue to look for answers, behind the Mysteries of Cannibalism. Have the Earliest Animal Footprints Been Discovered?